32 pages were found with this tag. In this podcast Ricardo Vargas talks about the highlights of the conference promoted by the british magazine The Economist in London that he attended last week. At the event companies like Google, Thomson Reuters, British American Tobacco, Mark & Spencer and others shared the main challenges to search for talent and develop human resources. Great project management insights. Part 1 of 2. 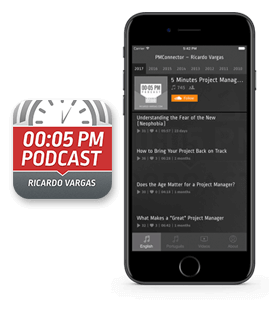 In this podcast, Ricardo talks about the beginning of a project management career and what we should do to prepare ourselves for it. He also briefly talks about the importance of training and having a project management certification, as well as the need to learn other languages and improve our networking abilities. This podcast was recorded only in Brazilian Portuguese. The link below is for the Brazilian Portuguese version.